The rain started in the last quarter of the Super Bowl and continued all through the night. Tooth pain woke me several times to listen to the rain, and wonder how complicated it would be to fit a visit to my dentist into the week. A couple times I turned on the patio light to see if I should start an ark. I hoped the newspaper deliverer wouldn't slip in the mud out front. The rain continued until mid-afternoon, after the dentist made impressions of my upper and lower teeth. I would rather eat mud than do that again! 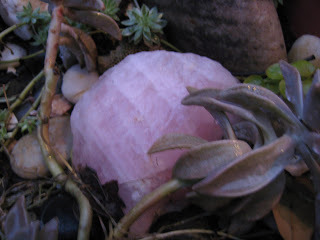 The rose quartz in my fairy garden looks particularly beautiful, cleaned by all the rain. I've had that piece of quartz since I was a kid. It's handful size. Posted a different view of my rainy day on the 365 Project. I like the process of deciding which photo best describes the day.